I am a people person - no two ways about it. I enjoy being with people, helping people, chatting with people, meeting new people and finding out what interests them. I especially like peeking into their homes and meeting their families. I have met some of the kindest and sweetest ladies since I uploaded pics of our home online on Webshots and on RMS, and now through blogging. Earlier this month I posted about meeting my new friend Kathy in person after chatting online for a few months. It was great! As bloggers like to do, Kathy told me about the blog of a very sweet gal named Karen. Karen's My Yellow Farmhouse soon became one of my favorite blogs to visit and her home pictures on Webshots lured me back time and again. We call it lurking! To say Karen is a very talented lady is an understatement. She has a lovely home and I so enjoy seeing her newest quilt or sewing project, her amazing wool creations - especially the penny rugs, her newest treasures, her beautiful seasonal decorating and her yummy recipes. I always wish I had been invited to her get together to see and taste it all in person. Too bad she is so far away - well, maybe it is good for her I live so far away - I just might show up uninvited! 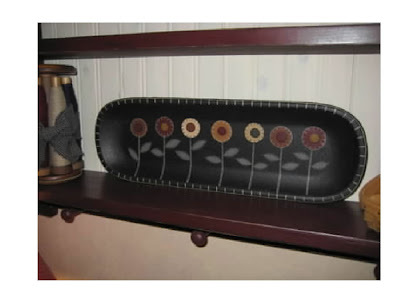 While reading some of Karen's older posts, made before Kathy even first told me about the blog, I came upon this picture of an adorable tray Karen had displayed. For those that don't know, this is painted to resemble a wool penny rug - so named because of the wool "pennies" that are stitched in a blanket stitch. Kathy and I had talked many about our love of penny rugs and I also knew that Karen was an expert at this art. I thought the tray was so cute that I actually saved this picture to my online file of 'things to make' - hoping I could find the right size bowl or tray to try and create something similar in paint. Well jump a few weeks ahead and after meeting Kathy in person, I found out that her birthday was coming up and of course, being a card maker, I had to make her just the right card. Karen's tray came to mind and I decided to try to recreate the design of the tray in paper - in other words, a paper wool penny rug - LOL! I opened that picture to my computer screen, gathered my card stock, stamps, markers and glue and knowing that the mail to New Brunswick would take several days longer than in the US, I quickly got to work and created this card and sent it off to New Brunswick right away. I was so pleased with my little card, I proudly showed it to my husband and even he noted that it looked the picture on my computer screen. 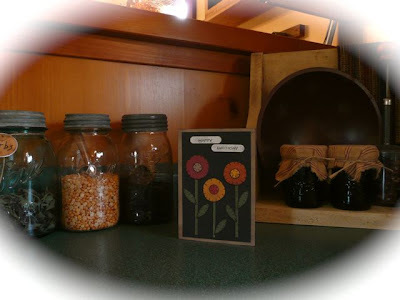 Before long, Kathy got back home to New Brunswick and her card arrived and she told me she loved it and that it reminded her of the tray on Karen's blog. It was a success - my little card was just what I wanted it to be. At that time, Karen was away from home, very busy at a quilters show and she squeaked in just enough online time to tell her 'peeps' that just before she left for the show, her hubby drew a number from the entries and it was #15, her son's hockey number through the years, and MY LUCKY NUMBER! MINE - ME - MOI - the one who had so loved that tray that she saved the picture and even created a card to resemble it. ME! I was so excited. I felt like a little kid! Fast forward to yesterday, after a harrowing drive home in a torrential downpour, hail and lightening and walking into a hot and muggy house I was starting to feel a little grouchy. Then Mr. Mailman knocked on the door and handed me a package. I saw the return address and got so excited. Bye bye grouchies. When I opened it, I found this lovely wrapped tray and some extra sweet treats as well - an adorable pen made from a teeny wooden rolling pen, the cutest recipe cards and a homespun dish towel. I just love homespun towels, and recipe cards, and anyone that knows me, knows I don't leave just any pen out in the kitchen and now I have the perfect one. After snapping the picture, I could hardly contain my excitement and I opened the little card - also cleverly made to look like a penny rug. I then tore into the tissue paper, and there was my sweet little tray. It is even sweeter in person! It was like Christmas in May!! So the next thing was to decide where should I put it. Oh so many possibilities! First I tried it on my dining room step back cupboard. Looks great doesn't it?? But you know me, I have to move things around so I tried it on my settle bench. Looks great there too, doesn't it?!! And then I tried it on top of my computer desk, where I spend hours each day, and it looks great there too doesn't it? Decisions, decisions! I just couldn't decide - so for now it is here in my craft room/office and I am enjoying it tremendously. Karen, you have a kind and generous heart and I thank you so much for having such a wonderful give away, and please thank your dear hubs for picking my number out of the bowl.